The HTSF2 is a compact heat exchanger. It remains true to our tradition of high cooling performance and functionality, excellent looks, and the renowned Watercool quality. The triple parallel layout of the HTSF2 ensures a low flow-resistance and its fin-design is optimised for low-rpm fans. The round tubing allows the operation at high pressures. 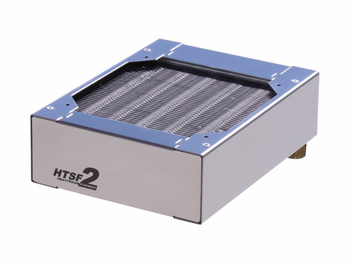 The HTSF2 constitute a 120 mm heat exchanger series. Their symmetrical layout allows fan mounting on both sides, utilising integrated M3 threads. Two G1/4“-threads are available for various fittings. Like all other Watercool products, the HTSF2 is produced using only high quality materials. The tubes are made from pure electrolytic copper, the fins from high quality aluminium. Thanks to the highly optimized production, only a minimal trace of soldering residue can be found in the heat exchanger. To further improve performance, the fins remain uncoated while the corpus is made from stainless steel. The Watercool logo is laser engraved. The HTSF2 is produced in Europe. Development and final assembly happen in Germany, like the manufacturing of most of its parts. The HTSF2 offers a wide range of accessories.